According to the story these are the words of Jesus to the man he met at the pool of Bethesda who had been disabled for 38 years. And he did stand up, pick up his sleeping mat and walk. We can read this story as a simple miracle story, which we can accept, dismiss or try to explain in the light of modern knowledge. Or we can read it as metaphorical and ask ourselves what is the mat that we cling to? what is blocking us for getting on with our lives or with what needs to be done? Earlier in the year as I sat in meeting for worship one morning I had a distinct sense of hearing a inward voice that said to me ‘Stand up Stephanie’ . I responded something like ‘You must be joking! Have you seen how difficult that is for me? Standing is not my best thing.’ But the voice was insistent ‘Stand up as best you can, and do what you can.’ So I’m standing up (literally or metaphorically) and doing what I can to make the world a slightly better place. If we all do that, one step at a time, we can bring the ‘Kingdom of God’ (or whatever we call it) a little closer to reality on Earth. And we can take our ‘mat’ with us for when we need to rest. The story also put me in mind of the pools and springs where some people still go to seek healing. I visited a variety of these when I holidayed on the Lleyn peninsula few years ago. One with a bathing pool and changing facilities, one with a structure to hold the water, one locked up, one a spring behind a barn. Looking online the Israel museum has a model of Bethesda pool in the second temple period (which is about when Jesus was around) which suggests something very similar to Roman baths elsewhere, which makes sense at that date and given the dominance of the Romans in the area at the time. I’ve been looking at this story recently because it is the chosen bible passage for the World Day of Prayer 2020 and the service materials prepared by Christian women in Zimbabwe have just reached the national committees. The service will also consider the themes of reconciliation, peace and love. I have just been appointed as the Quaker representative on the World Day of Prayer (England Wales and Northern Ireland) national committee. In that capacity I spent 4 days in November at Launde Abbey in the Leicestershire countryside, with the rest of the committee, starting to prepare the materials for publication here. I enjoyed working in the small group looking at the children’s materials. 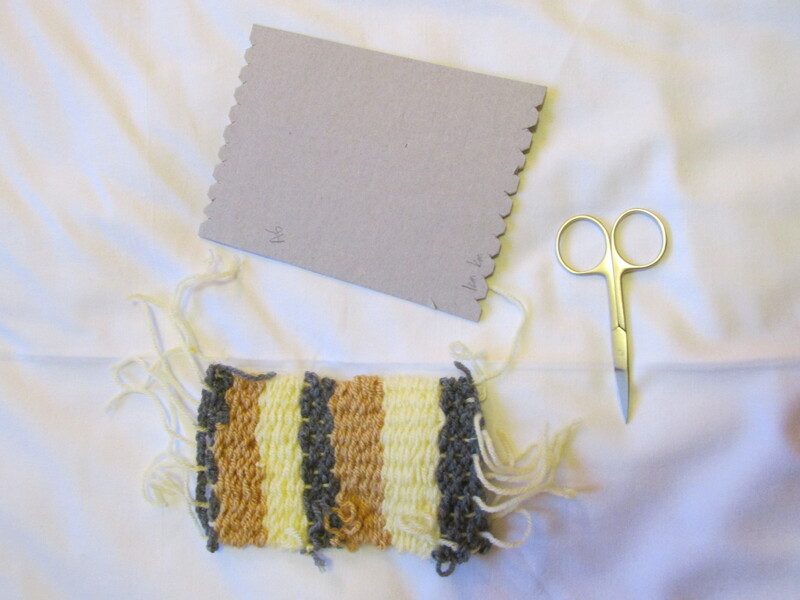 Weaving mats and other items is a craft commonly practised in Zimbabwe and since the bible story features a mat it is suggested that children might like to make a simple mat. 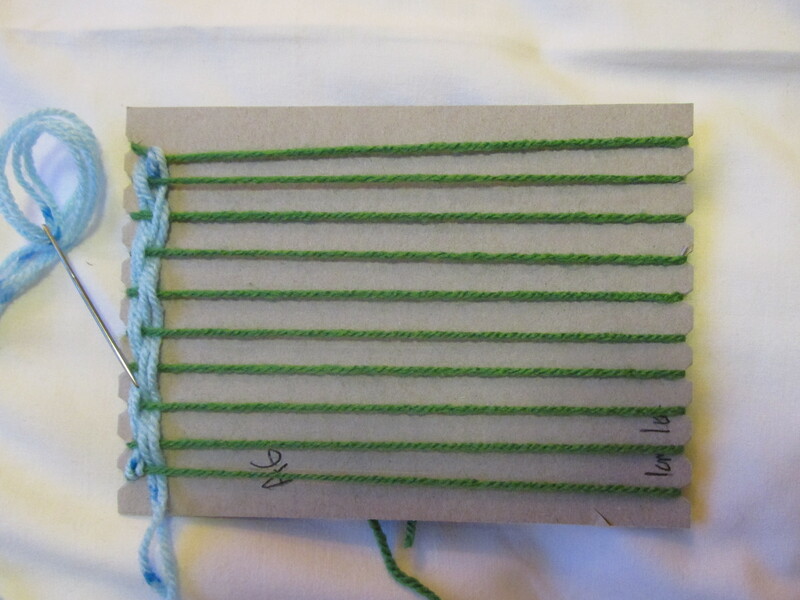 We have suggestions for weaving paper, and also for a very simple loom to use with knitting yarn or raffia. 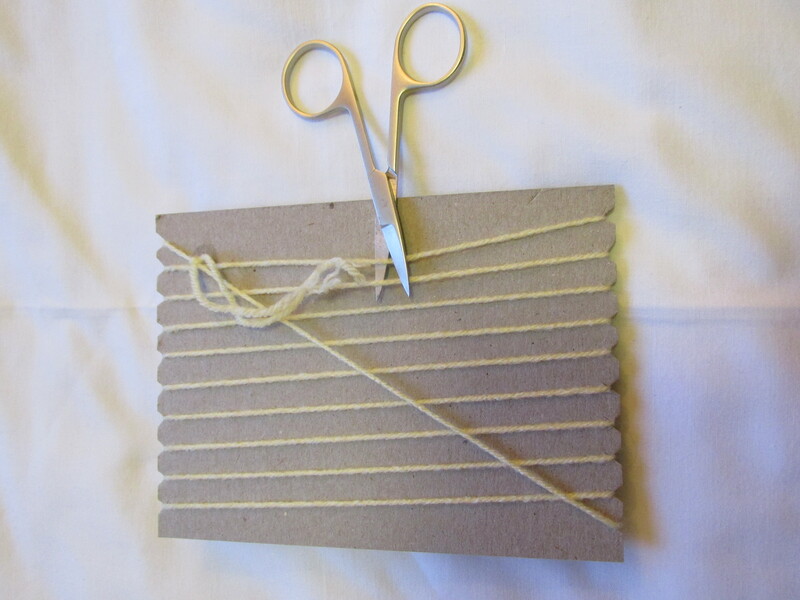 I’ve photographed my simple cardboard loom in use, if anyone would like guidance on how to do this. I used a sheet of A4 card (the back of a pad of paper) cut into 4 A6 pieces and cut notches at 1cm intervals along the 2 short edges. 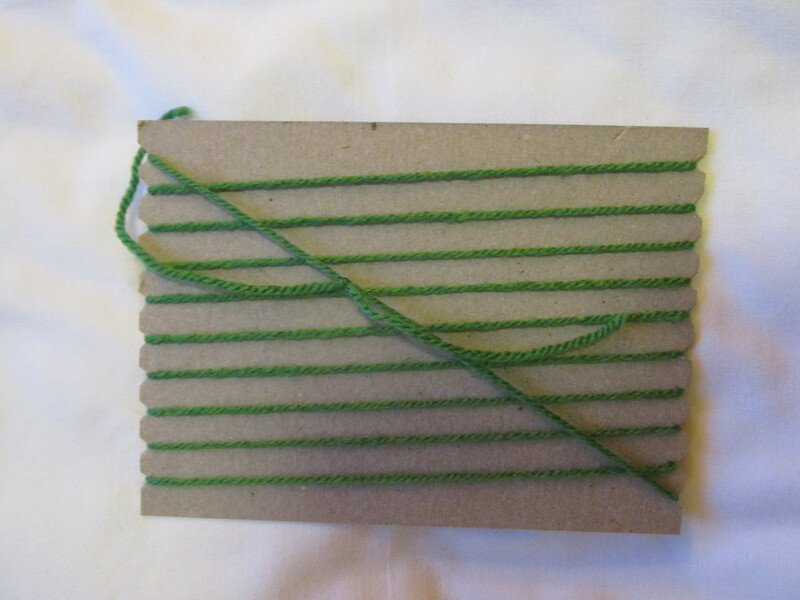 The stationary (warp) thread is then wound up and down round the cardboard and the ends knotted together to hold the thread reasonably tightly. 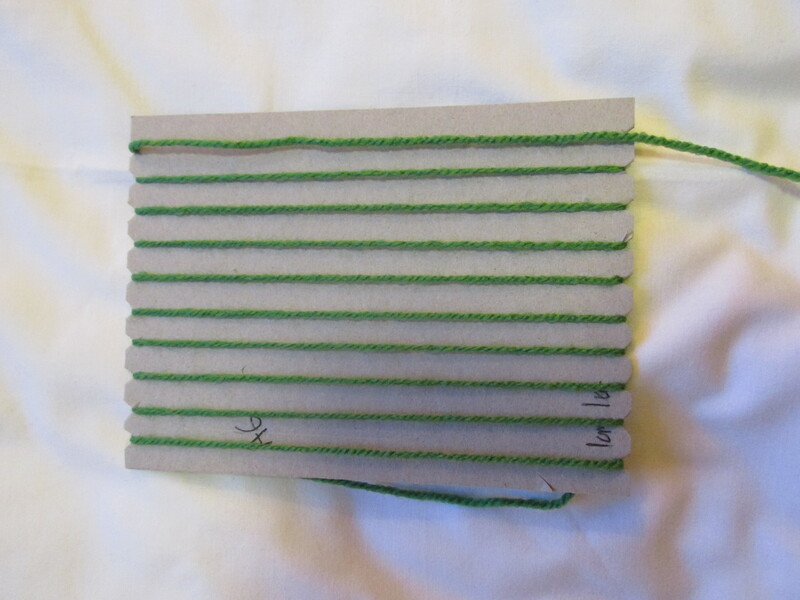 Weaving (weft) threads can now be woven (under, over, under, over, …) through these. I used doubled double knitting (DK) yarn and a large needle for this. 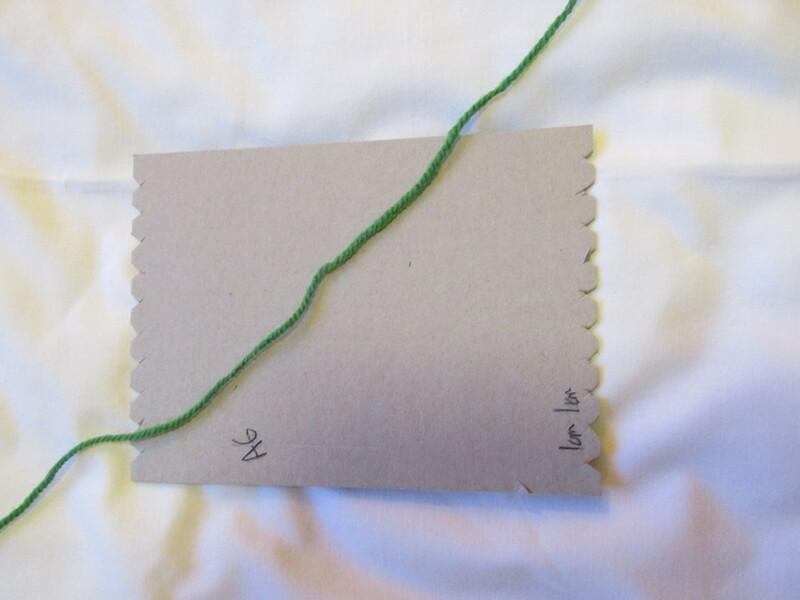 Thread could be wound onto a small piece of card with a notch either end making an improvised bobbin if no needle is available. 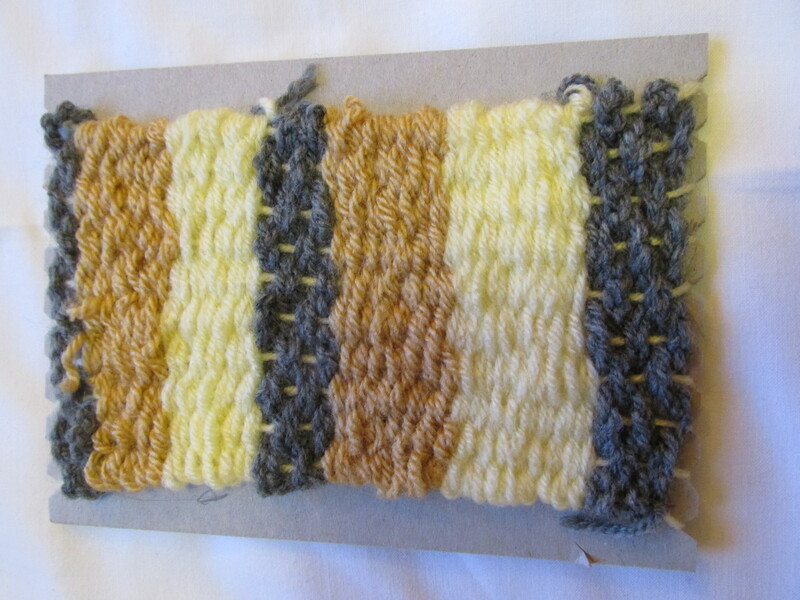 Using thicker would be easier if available yarn, or alternative materials such as raffia or straw could be experimented with. A6 card with notches at 1cm intervals (works at all sorts of sizes but this is small enough to give a result quickly). 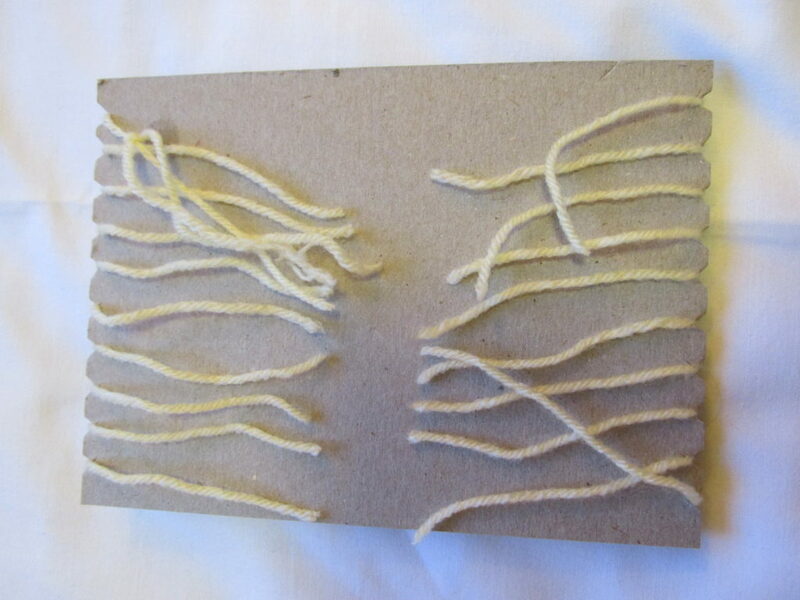 Start at one side and wind the thread round the cardboard. Warp threads in place, turn the loom over. Tie the ends of the thread together. Turn back to the front and secure the weaving thread with a simple knot. Weave over and under the threads, ensure that the rows alternate, that is go over the thread on the second row that you webt under on the first row. 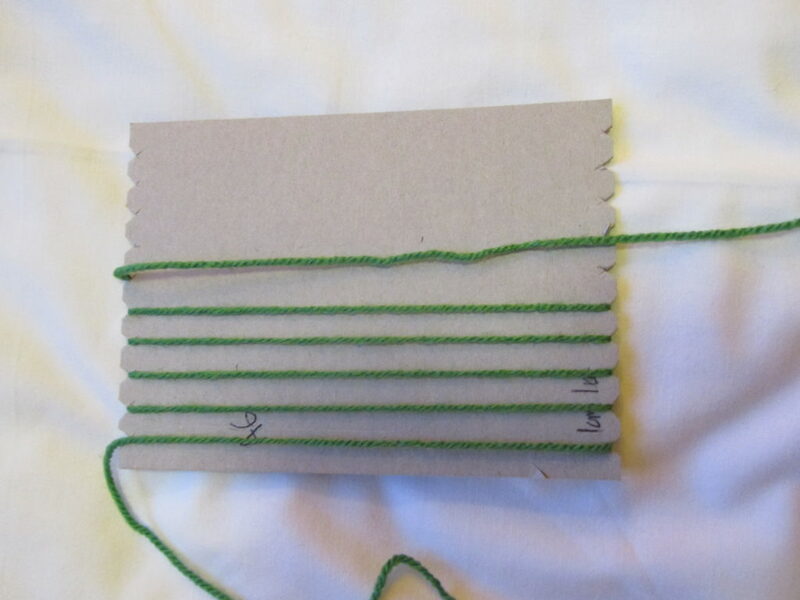 Pull the thread through just far enough not to leave a loop at the edge. 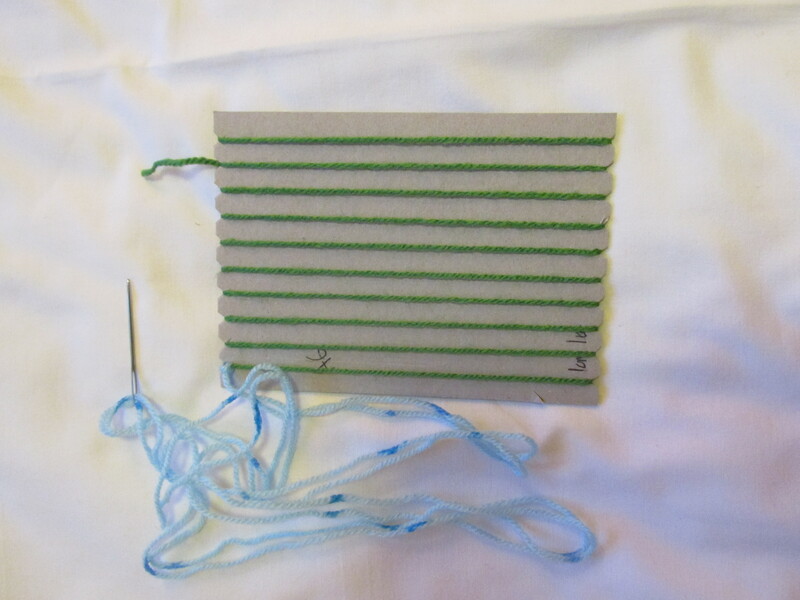 Care needs to be take not to overtighten the weaving thread, but to keep the edge straight. Weaving threads will need to be pushed up the loom to make a firm fabric. 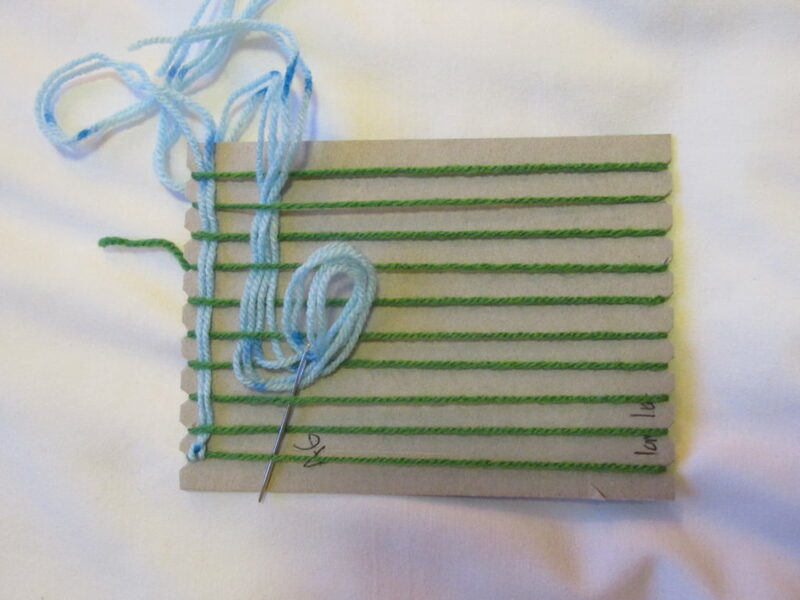 This can be done with the needle.Join a new thread when the first runs out. The same colour can be used, or a different one. 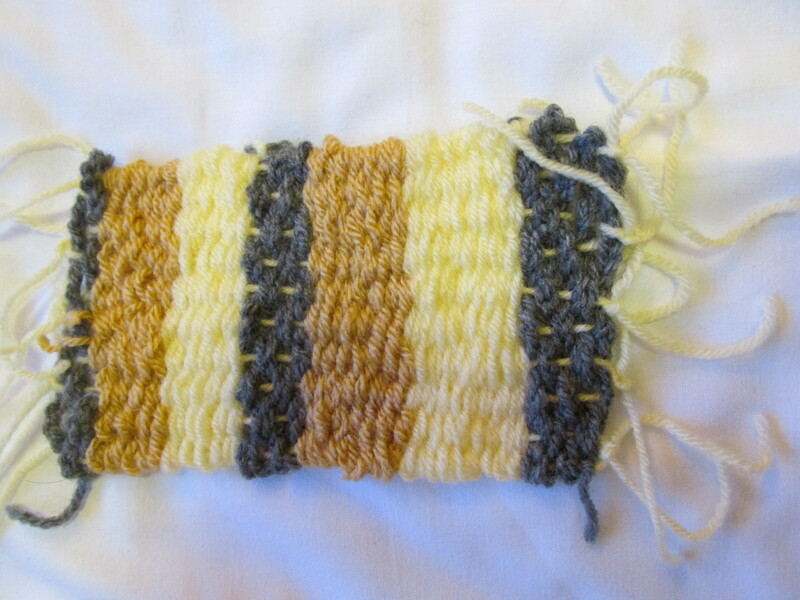 Making stripes is easy and fun. 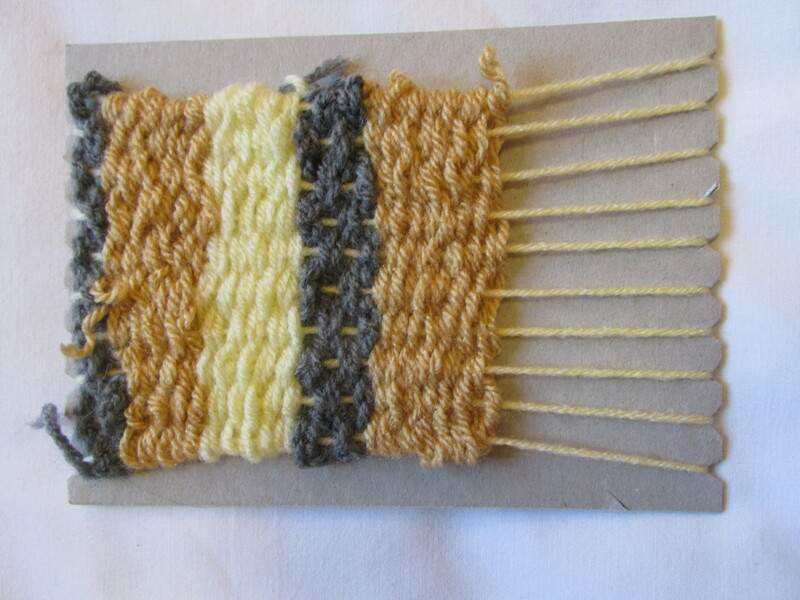 Here’s the mat I made earlier, with the weaving nearly completed. 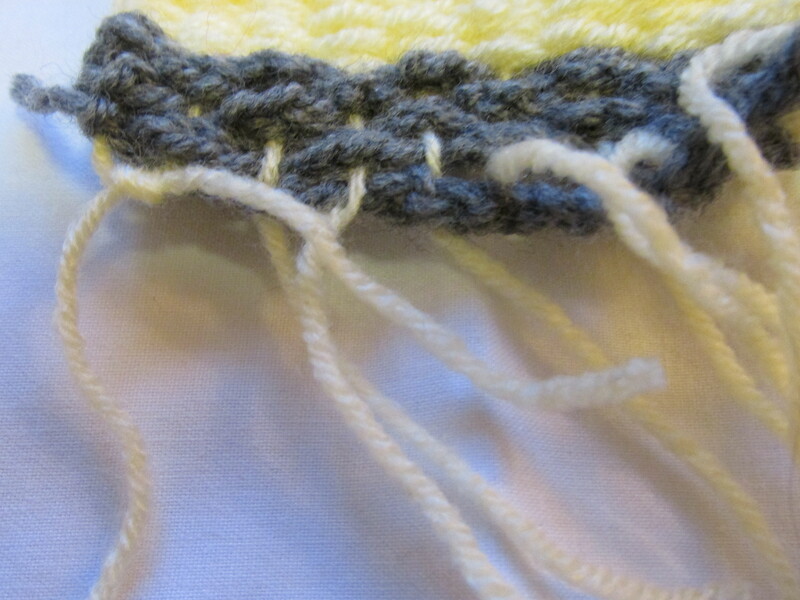 Turn over and cut the threads in the middle leaving lengths of yarn at both ends of the mat. All cut. Lift the cardboard away fro the weaving, but handle the mat carefully at this stage. Knot the ends together in pairs, then you’re done! 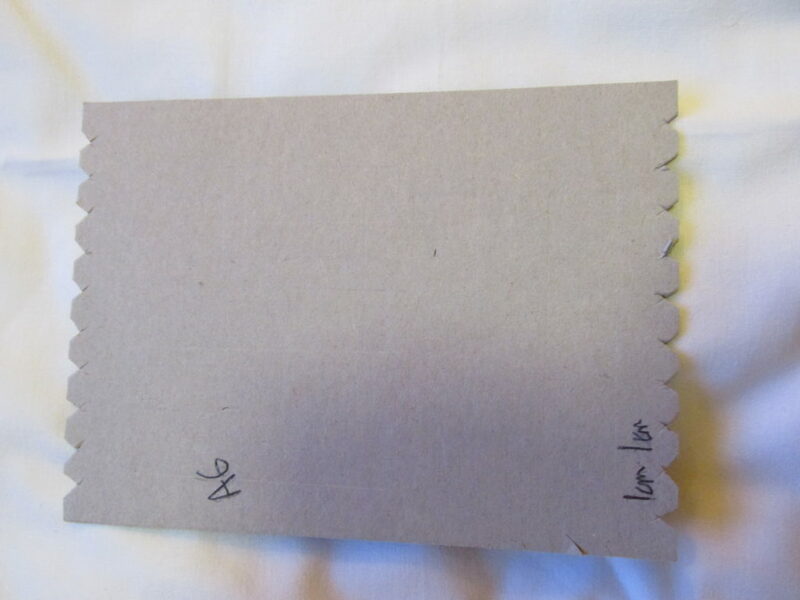 Photograph of finished article is at the top of the page. Lovely Stephanie! 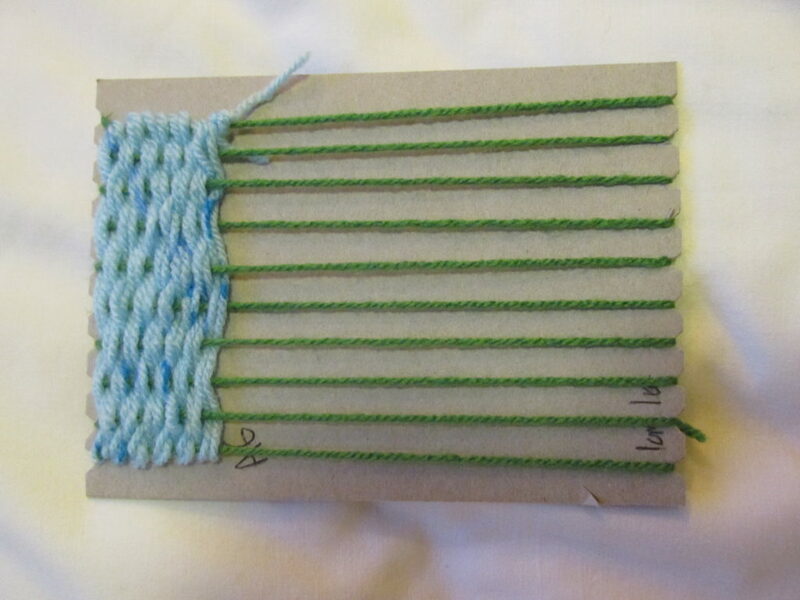 I’ve done loom weaving like this in the past and it was fun to do. Thanks.